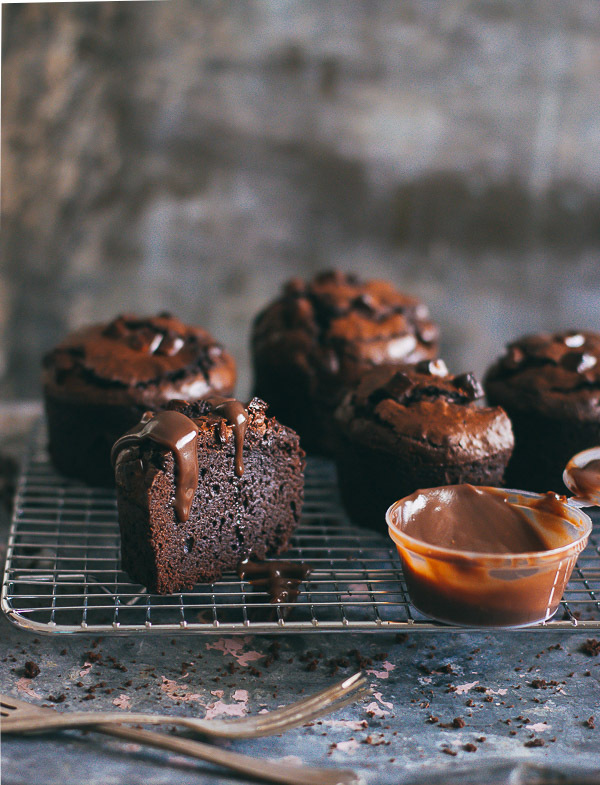 Ultimate Brownie Muffins - Pretty. Simple. Sweet. 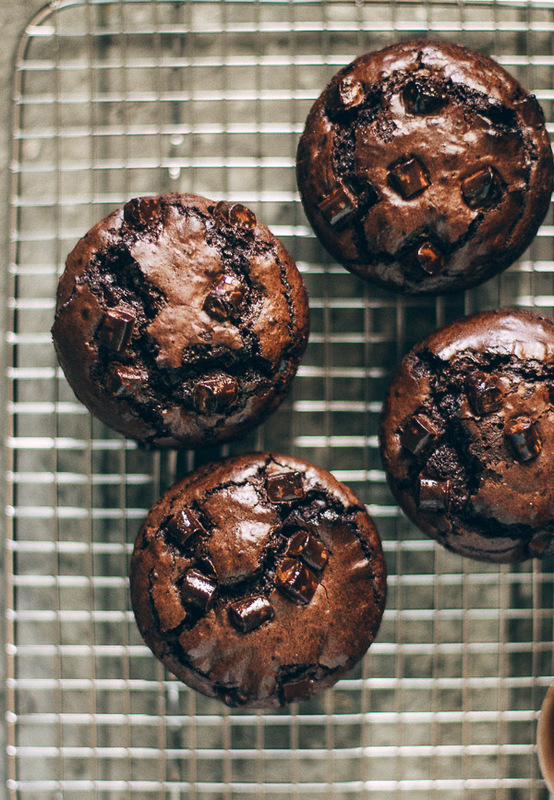 These are the ultimate brownie muffins—dark, rich, dense, and fudgy with a deep to-die-for chocolate flavor. Brownies are one of my favorite simple desserts in the whole world, and I have more than ten different recipes for them that I make regularly. 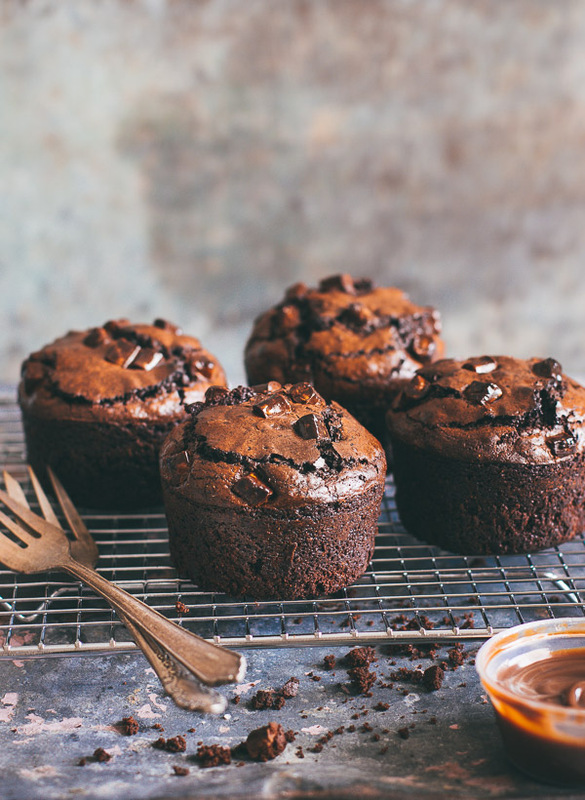 When it comes to brownies in a muffin form, though, there’s so far only been a single recipe that I keep coming back to. It creates brownies that hold their shape well, yet stay fudgy and soft in the center. They look good, and taste ten times better. The recipe starts with whipping the eggs until they’re pale and thick. This step is what makes this lovely crackly, shiny top. Although air is incorporated into the batter, the muffins still turn out dense and not airy, which is how we all like them, right? The combination of melted chocolate and cocoa in the recipe makes for an over-the-top chocolate flavor. Be sure to use the highest quality products for the highest quality results. The right baking time is always the most crucial part of making brownies. It only takes a couple of minutes to turn them from rich fudge brownies to a dry chocolate cake. When done, brownies should appear baked on the outside, but the center should still be soft. You’ll need to bake them only until a toothpick inserted into the center comes out with very moist crumbs, not dry. 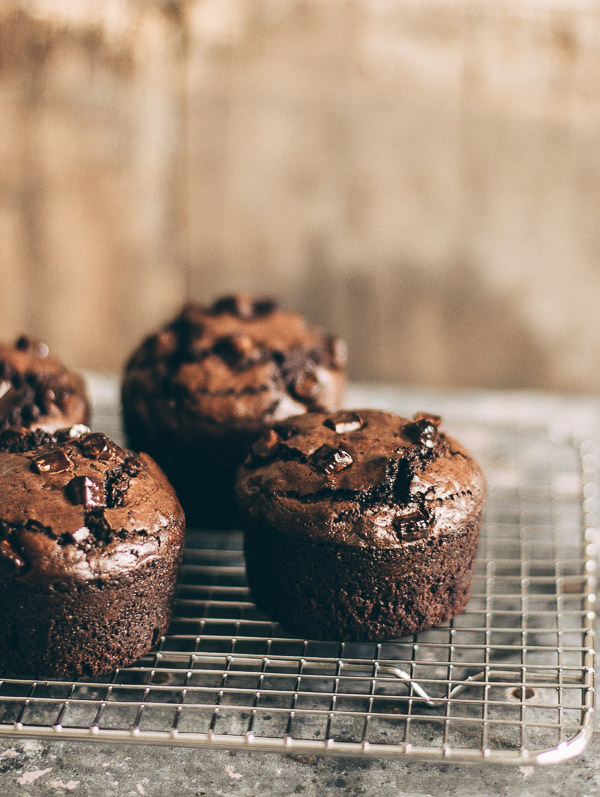 These brownies are also great as a cupcake base. I love topping them with coffee, peanut butter, salted caramel, or marshmallow frosting. Some of you have asked me what kind of pan I use for these muffins. I have 2 pans – jumbo and standard, and I love them! Click here to get it. Preheat oven to 350F/180C. Line 12 muffin cups with liners. Set aside. To make the brownies: In a medium heatproof bowl, place chocolate and butter. Heat mixture in the microwave in 20-second intervals, stirring between each interval, until melted. Alternatively, you can set the bowl over a saucepan of simmering water, stirring occasionally. Set aside. In a small bowl sift flour, cocoa, and salt. Set aside. Using a mixer fitted with the whisk attachment, whisk eggs and sugar on high speed until thick and pale, about 4 minutes. Reduce speed to low and slowly add in chocolate mixture. Stop the mixer. Add flour mixture and fold, using a rubber spatula, just until combined. Do not overmix. Divide batter between liners, filling them about ¾ full. Bake for 13-16 minutes or until a toothpick inserted into the center of the muffins comes out with moist crumbs and not dry. Be careful not to overbake as this will make the brownies dry. Transfer to a wire rack and let cool for 10 minutes before removing from pan. Allow muffins to cool completely on a wire rack. Store muffins in an airtight container at room temperature or in the refrigerator for up to 2 days. Allow to reach room temperature before serving. These look simply amazing! It is a genius idea to make a brownie muffun. You don’t have to worry about cutting them up and breaking and getting crumbly. I am hoping to have some time to make these this weekend, I will let you know how they come out! Thanks for all the great recipes, Shiran. I made these muffins this weekend and they came out tasting amazing! My muffins came out different than yours did, though. I noticed that I only had enough batter for 8 muffins out of a 12 muffin pan. The muffins were also not as crackly and shiny as yours. Unfortunately, I have an older hand mixer that does not have whisk attachment, but I whipped the eggs and sugar as you directed. I am wondering why I didn’t have enough batter, since I didn’t put too much batter into the muffin cups. Hi Cassie! Each muffin pan is a bit different in size. Did you use muffin liners? With the liners you should get at least 10 muffins. Try to whip the eggs and sugar for a longer time, or just double the recipe. i‘m thinking about reducing some of the melted chocolate, crumbling the rest and add that to the dough to make for some chewiness. will let you know how it turns out, :-). Making these as soon as the weather cools down and it’s safe to turn on the oven again!! Hi! This recipe looks fantastic, i’m wondering where you got your muffin tin, I like how these muffins are straight-sided not slanted. Hi Nikki, I have a few, but I really like this one (there are different sizes). I tried this amazing recipe and it went down as soon as I took it out of the oven? I made it a bit smaller to get more out of the batter. Is that why it happened or what did I do wrong?? Even tho it didn’t look as great as yours, I had to share it with my family and they all LOVE IT! Hi Hasina 🙂 Do you mean that it rose in the oven and then sank? There are many reasons why this could happen. Were the muffins very soft in the center? Because that could be the reason for it (if so, maybe try to bake it for a bit longer next time). Can I use natural unsweetened cocoa Instead of Dutch process? Recipe looks amazing! Hi Dally! You can, but personally I prefer the color and flavor of Dutch process cocoa powder for this. I made this brownies and they were just amazing. I have question, they sank while they were in the oven. Why did this happened? I followed the instructions step by step. Hi Hannah! At least I’m glad they’re delicious 🙂 This can happen for several reasons. Overbeating is a common reason why cakes sink, so maybe try to beat the eggs/batter less next time. If the oven temperature is off, this can also cause cakes to sink. I made these Muffins today, but I wondered, if they are supposed to rise in the oven. Mine didn’t. Maybe it’s because they don’t contain baking powder? They also did not get this glossy shine on top. Hi Martin, it sounds like the eggs weren’t whipped enough. It’s important to use a mixer and whip the eggs and sugar on high speed for several minutes. This is what causes the muffins to rise (since there’s no baking powder/soda), and this also what gives them their shiny tops. I also tried your recipe and also had only enough batter for 8 muffins and they also did not rise, I was wondering if you didn’t add some baking soda of powder and overlooked it in the ingredient list? Hi Patricia, there’s no baking powder or soda in the recipe. The batter gets its volume from whipping the eggs. It’s important to whisk them for several minutes, and then add the rest of the ingredients slowly or by folding and mixing as little as possible. If not whipped right, you’ll end up with less batter than you should and the muffins won’t rise. I will make sure to use a different muffin pan next time I make the muffins to see if I get less than 12 muffins. Thank you for your reply, You know, I’m not new at baking or at whipping eggs, and my muffin pan is totally standard, so yes I would like to see what you get with using another muffin pan 🙂 Anyway, your batch was gorgeous and tempting. Thank you Patricia, I promise I’ll look into it. Having accurate recipes is very important to me! These muffins taste so unbelievably good!!!! I filled them with homemade chocolate pubdding (because, why the hell not) and had to eat one immediately. Thank you!! Thank you Ana! Adding the pudding sounds delicious! Yes, you can! I used a silicone mold as well. Can u use chocolate mixed with heavy whipping cream instead of butter?? Hi Jacque, unfortunately you can’t use heavy cream instead of butter for this recipe. 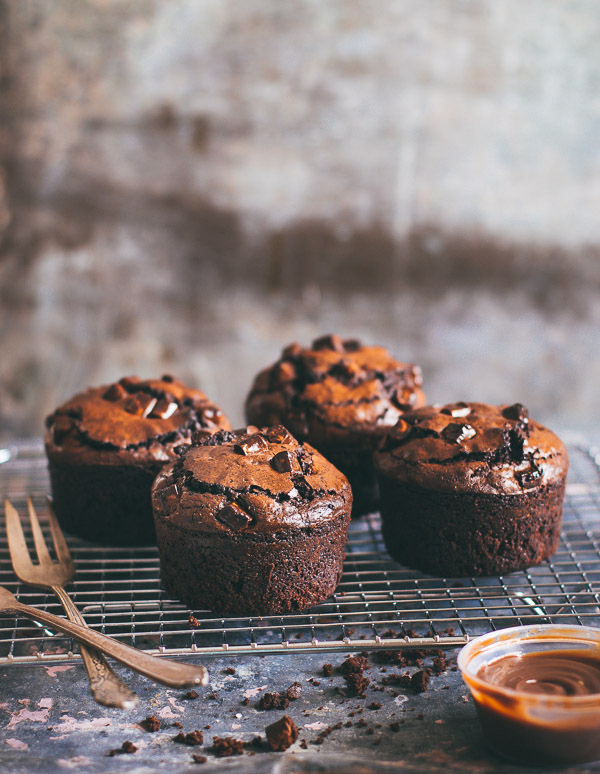 My mouth is watering looking at these, Cannot wait to try this recipe over the weekend! Can I put peanut butter and swirl in top of the brownies before gets in the oven?? Hi Rita! You can, but these brownies are more cake-y, and I prefer to do the peanut butter swirl with brownies that are more fudgy. This should be ok though, if you want tot try it. Really great recipe success every time. I recently had to make them egg free so used ripe avocado in place of the eggs, which meant I didn’t have a guide line for how long to whisk with the sugar. End result was tasty but a little crumbly. Any ideas for next time? Hi Margaret, without eggs it makes sense that it’s crumbly. Eggs also give richness. I know that in some recipes you can replace the egg with a small banana or applesauce but I don’t know how it would work in this recipe. Whipping/whisking is not necessary if you don’t use eggs. You only need to mix the ingredients together. Hi! 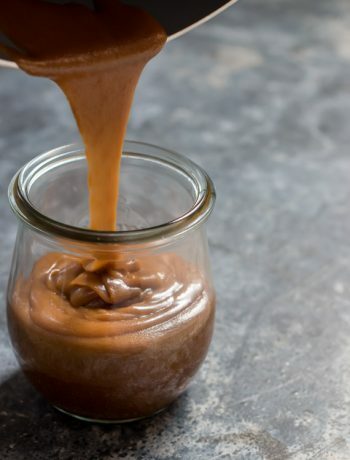 I found your recipe and i was looking through my cupboard and saw i only have unsweetened chocolate and i really would love to make these for tomorrow. any tips? Hi Lina, here’s a good source on how to substitute chocolates. You can try it out but I can’t guarantee the result. I am making this in the morning, hopeful you answer this before i make this. 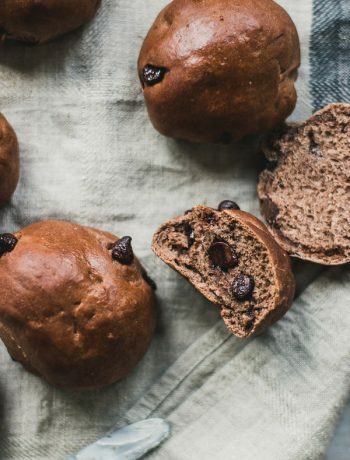 Can i substitute more chocolate chips for the cocoa powder? Hi Angla, this recipe is so good that I recommend sticking to the recipe. It’s possible to leave out the cocoa powder and add a bit more flour (I don’t know the exact amount without testing), but it gives a wonderful flavor to the muffins. OMG! These are just amazing! Made these for my sister’s 30th birthday meal and I’ve had requests for more! I only have a hand electric mixer so whisked the eggs for longer than recommended and added a pack of chocolate chips definitely making these again! Looking forward to trying out this recipe tomorrow. Did you throw chocolate chips on top right when they came out? And what’s the chocolate sauce in the picture? Looks delicious! Hi Clare, the sauce is a simple chocolate ganache, click here for the recipe. I added the chocolate chips on top before baking. Wow, wow, wow!! So delicious, fudgy and decadent. This is exactly what I think of when I think of a brownie. Thank you for sharing, this will be my new go to! Hi Aviva, the recipe make about 5-6 jumbo muffins. The temperature is the same. Hi Aviva, the recipe makes about 5-6 jumbo muffins. The temperature is the same. OMG these muffins are amazing. Printing the recipe to keep in my book. Thanks a lot for the recipe. 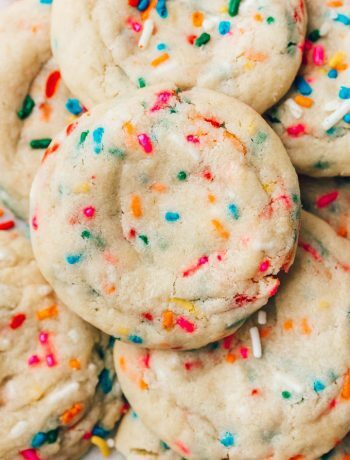 I wanna use a microwave to bake these. What’s the right temperature and time that they need to bake for in order to have fudgy cupcakes? Hi Andrea, I don’t recommend baking these in the microwave. The result will be different. Would you recommend cold or room temperature eggs? I know sometimes it matters!